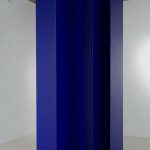 The influential art practice of Claude Tousignant can be understood not only in terms of geometric abstraction but also as investigation, experiment and research. 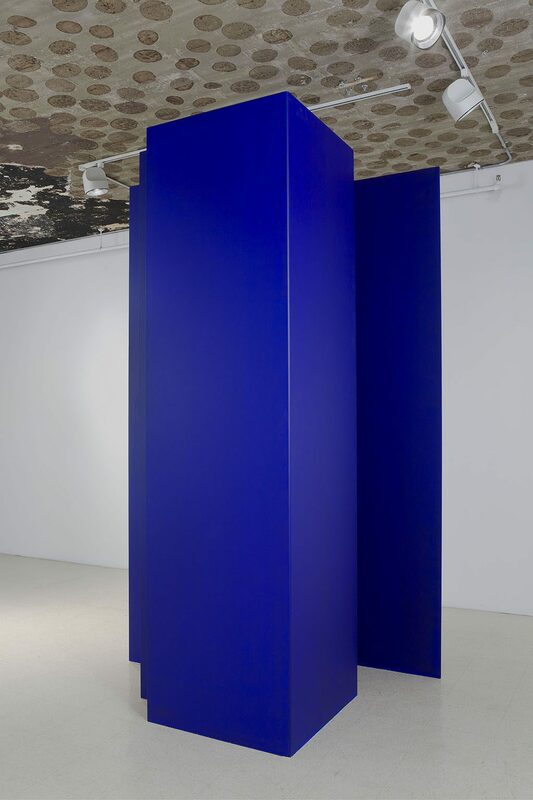 His work today continues to resonate in our contemporary discourse around the possibilities and impossibilities of the white cube and its relationship with debates surrounding the definition of the art object. 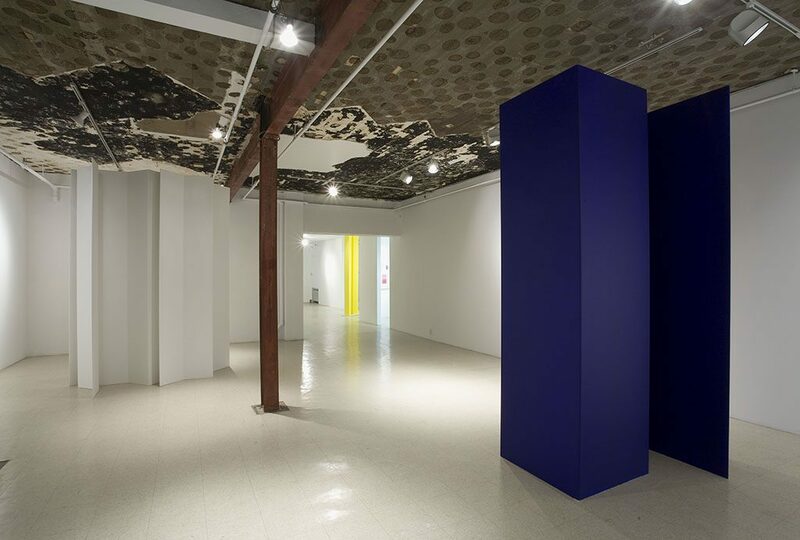 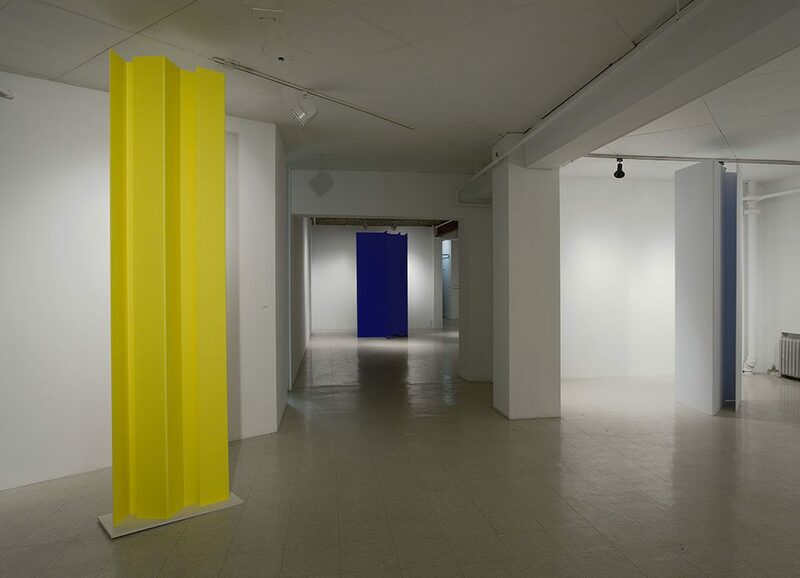 In 1959, on the occasion of the mounting of the exhibition, Art Abstrait at the École des Beaux Arts in Montreal, Claude Tousignant, declared “What I wish to do is to make painting objective, to bring it back to its source – where only painting remains, emptied of all extraneous matter – to the point at which painting is pure sensation”. 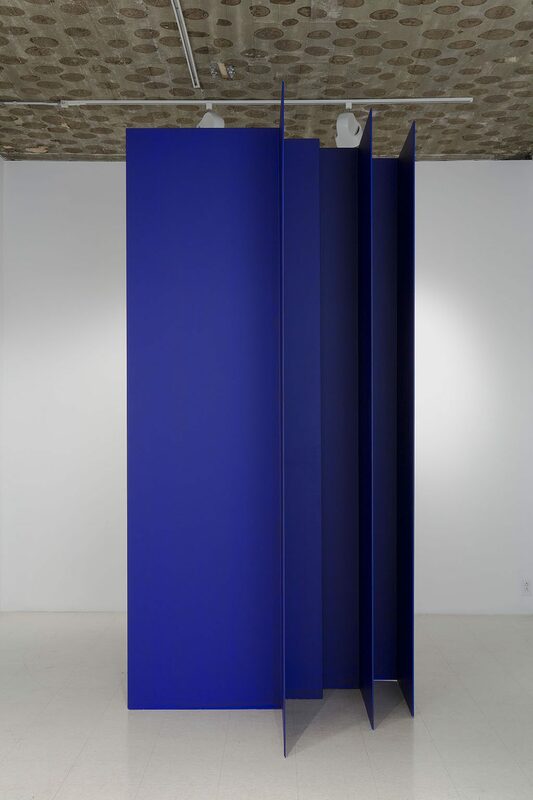 (Claude Tousignant, “Pourune peinture évidentielle”) Thus began Tousignant’s rigorous abstraction of medium. 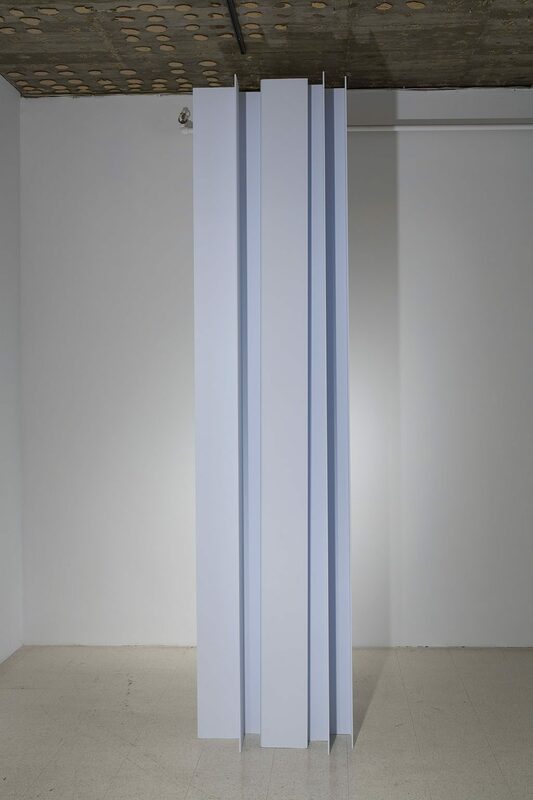 Widely known for his geometric abstraction paintings, including his circle series, ” Gongs” and “Bull’s Eyes” , Tousignant’s practice has moved in a trajectory from Monochrome orangé (1956), to a progressive investigation of the spatial relationship between painting and the white cube. 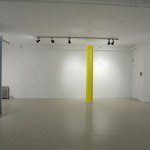 This examination of the implied relationship between form and space has culminated in his extension toward the sculptural field. 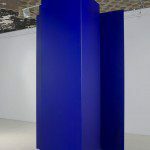 For the exhibition at Art Mûr, Tousignant’s installation, Modulateur luso chromatique , consists of a selection of eight sculptures in a series of numbered “Modulateur de lumière”. 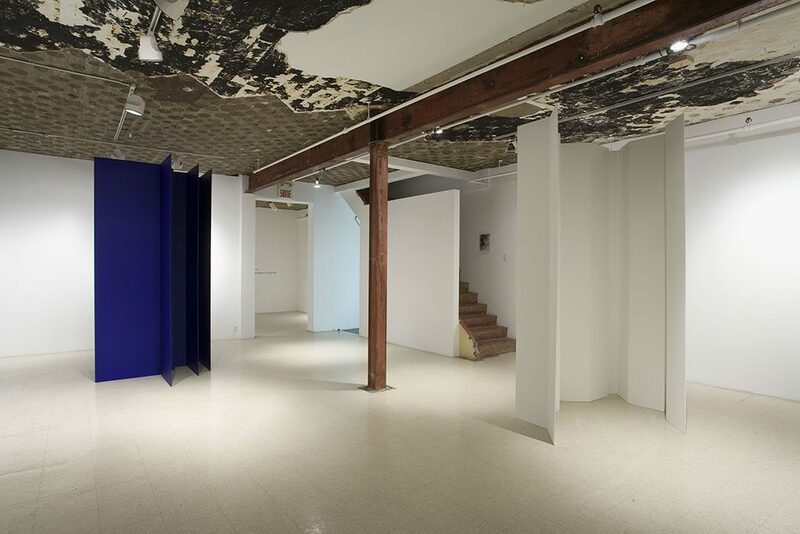 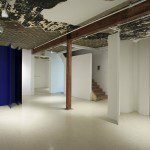 The works invite the viewer to experience the relationship between the forms and the gallery walls, floors, the ceiling and passageways. 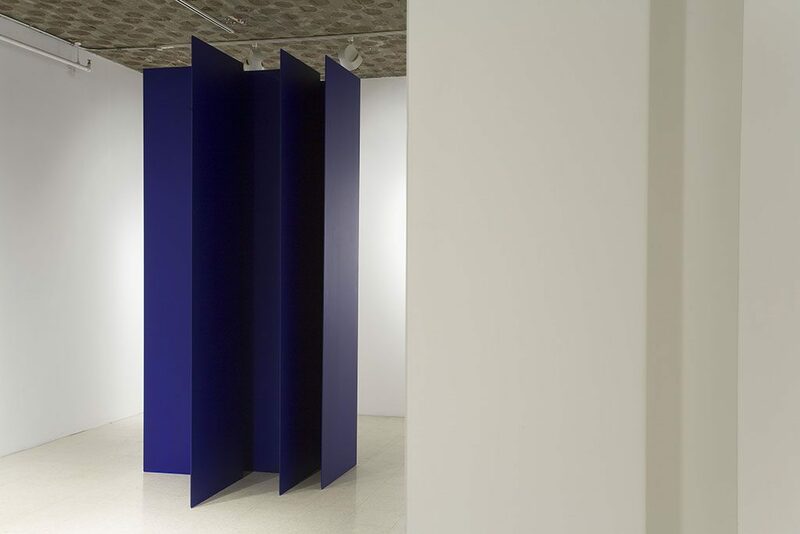 Michèle Thériault, curator for Tousignant’s 2005 solo exhibition at the Leonard & Bina Ellen Gallery, has proposed that Tousignant is in fact presenting “prismatic” viewing conditions where at every turn transformations of a visual, spatial and corporeal nature take place.” (Michèle Thériault, 3 paintings, 1 sculpture, 3 spaces) In this way the physical space of Art Mûr as white cube is particularly interesting with its exposed beams, varying wall angles and openings which allow for potential and possibility in an interaction between the rooms and Tousignant’s work. 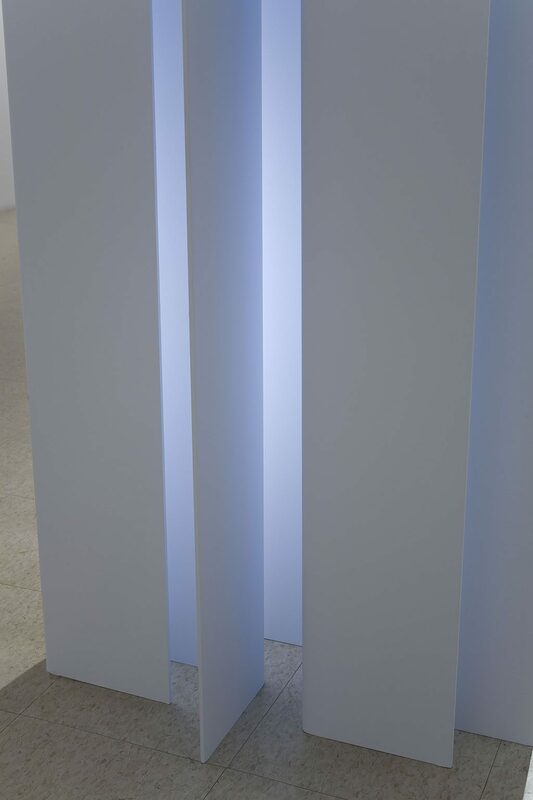 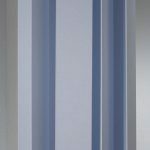 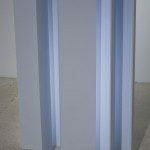 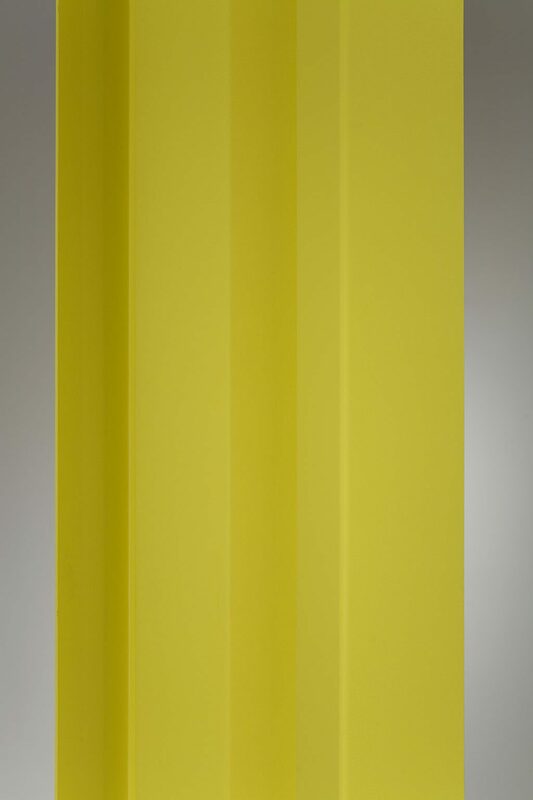 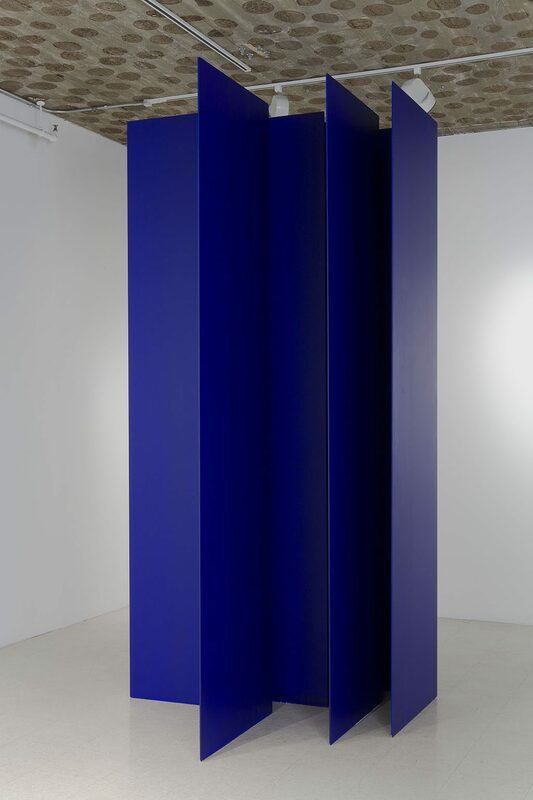 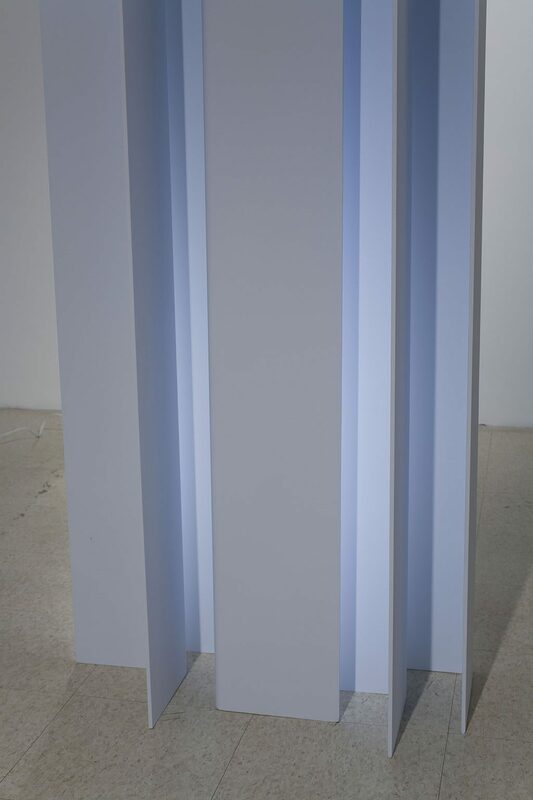 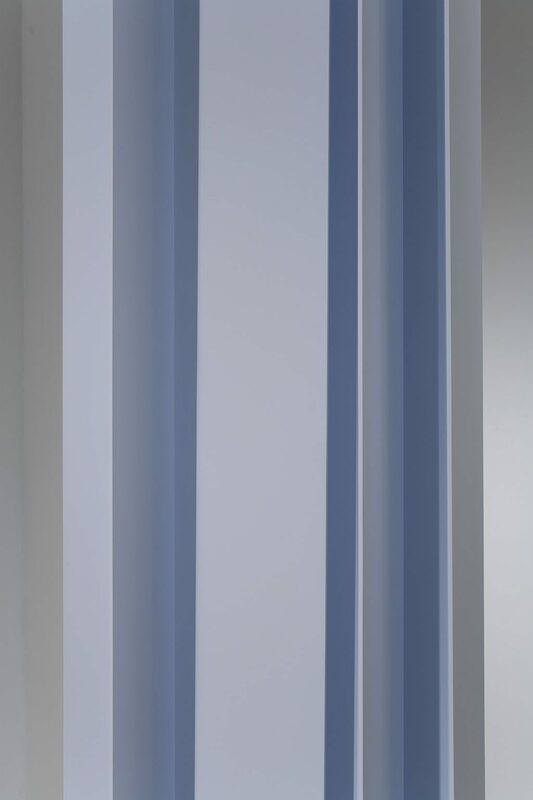 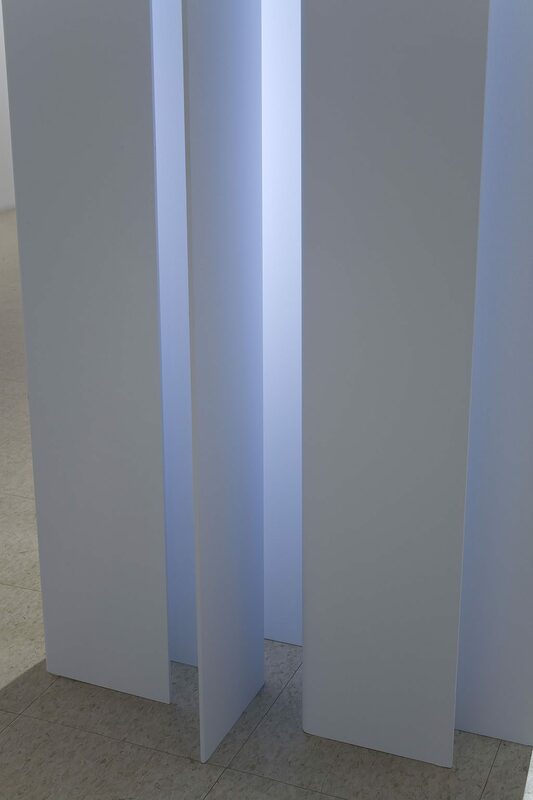 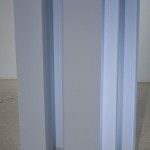 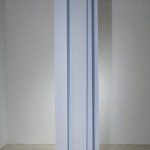 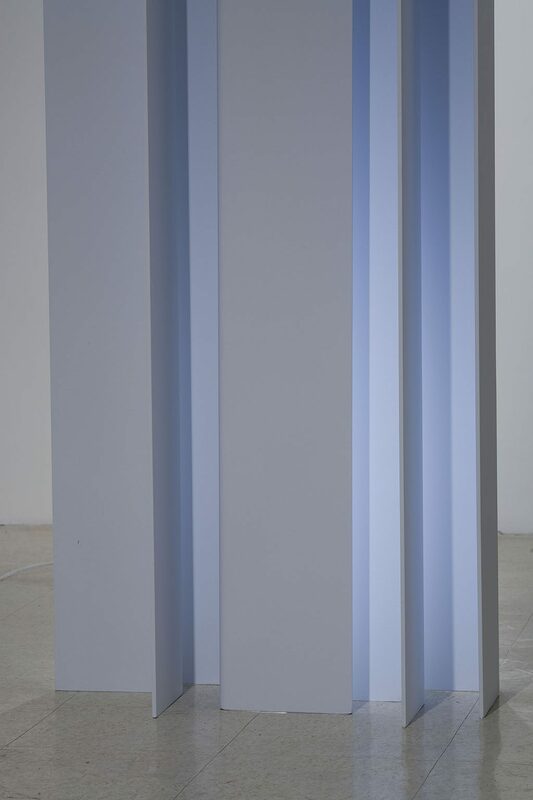 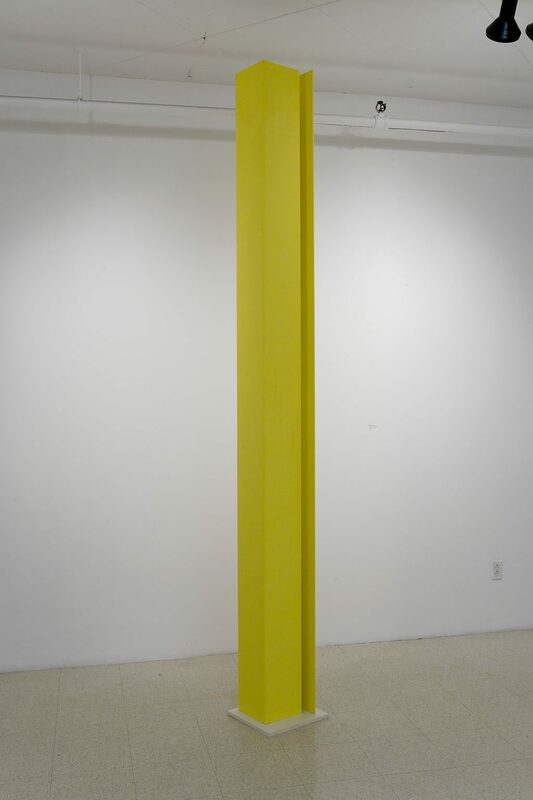 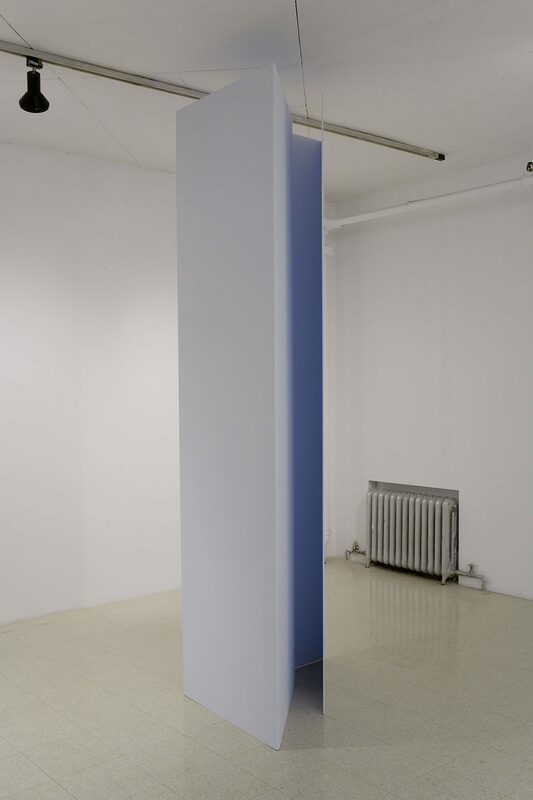 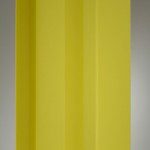 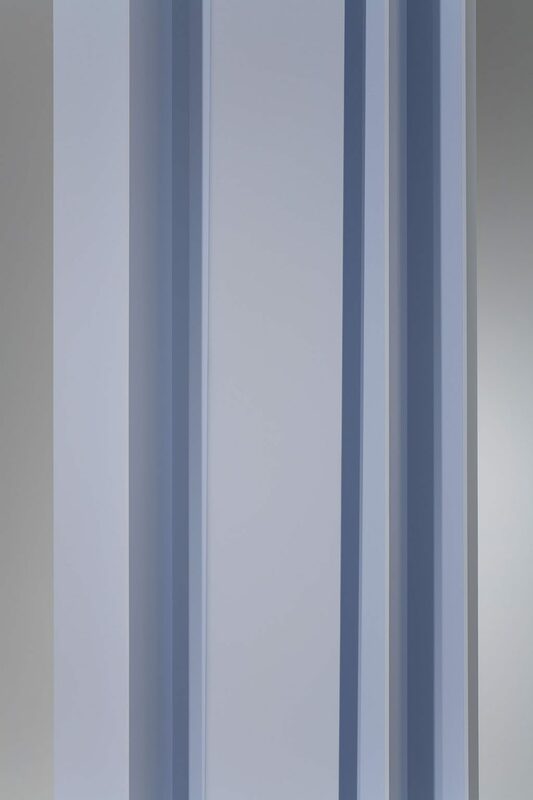 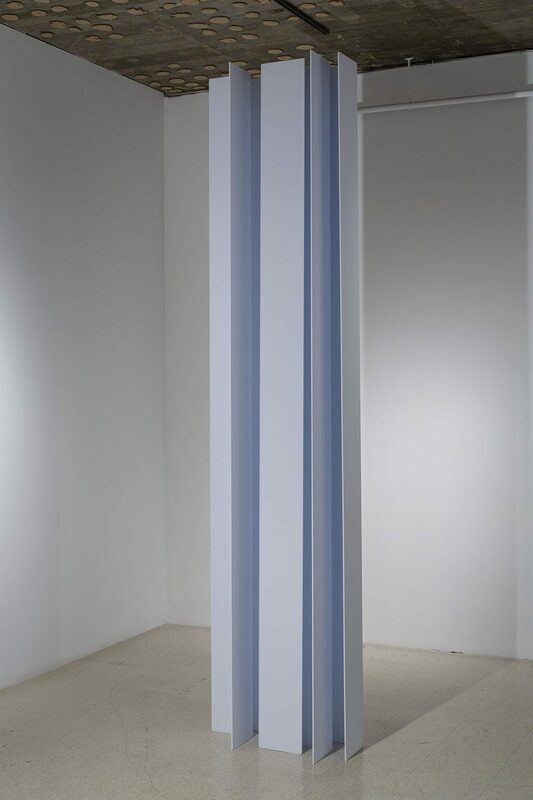 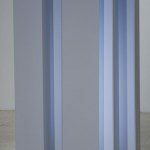 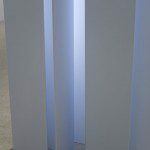 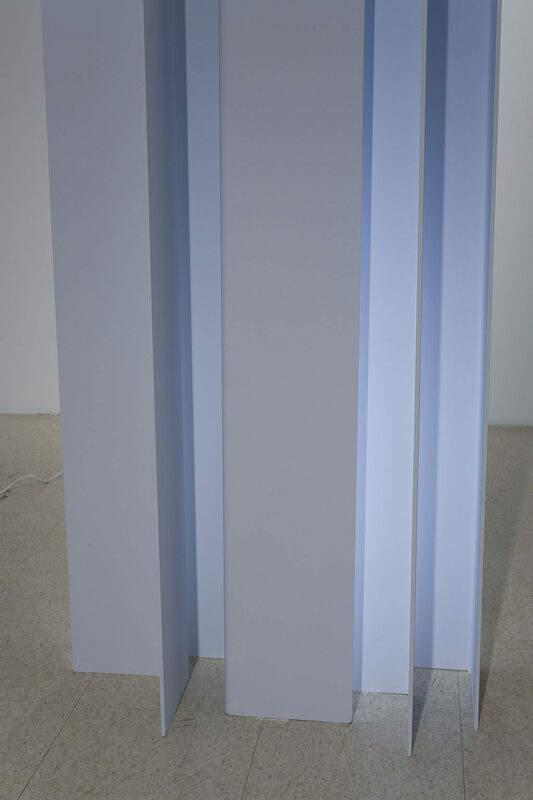 Each sculpture is acrylic on aluminum, of the same height (112″) with variances in width and most significantly, colour. 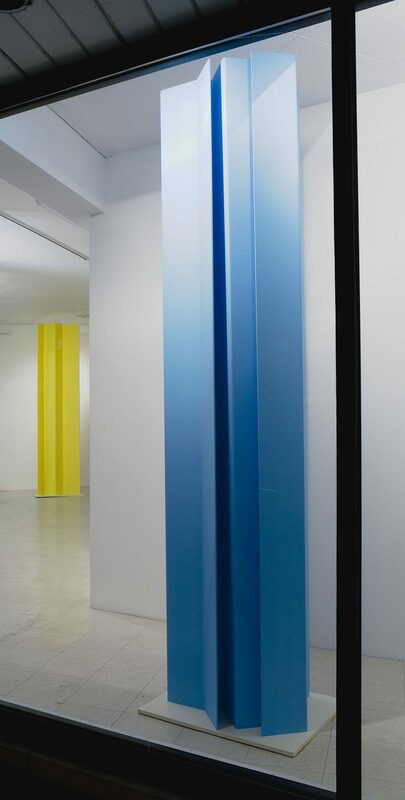 In an investigation of the effect of spatial dynamics and light on colour, connections can be made with Tousignant’s earlier circular forms, described as explorations of colour which “emphasize the harmonious relationships between light and form”. 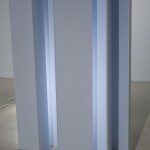 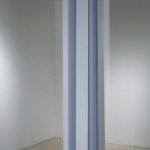 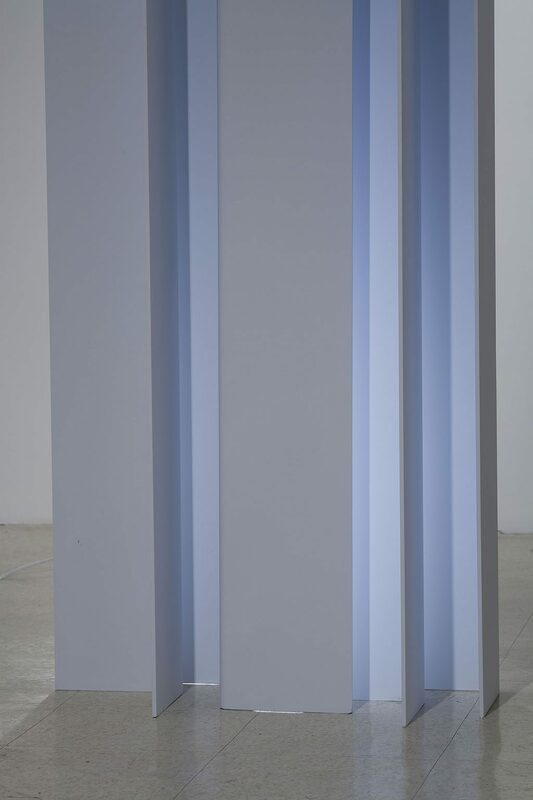 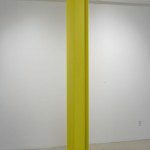 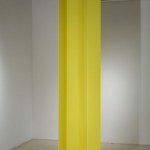 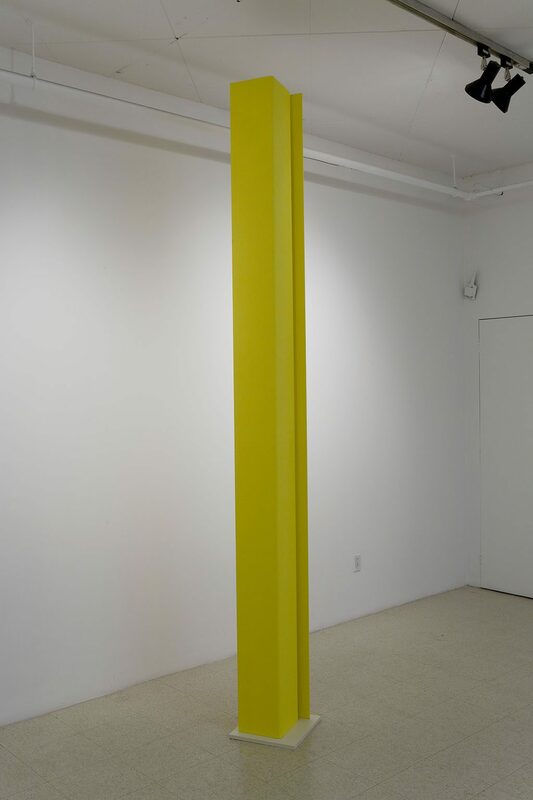 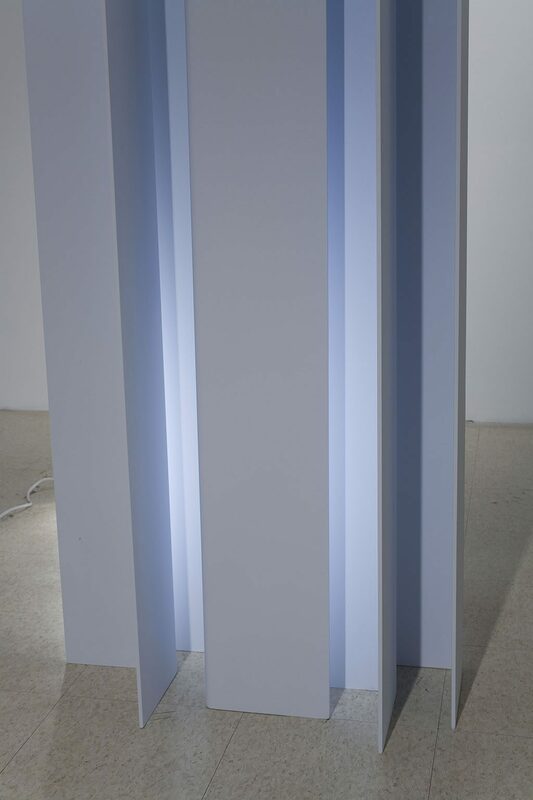 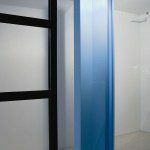 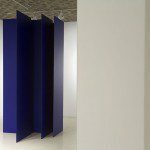 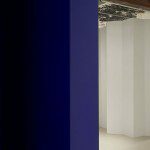 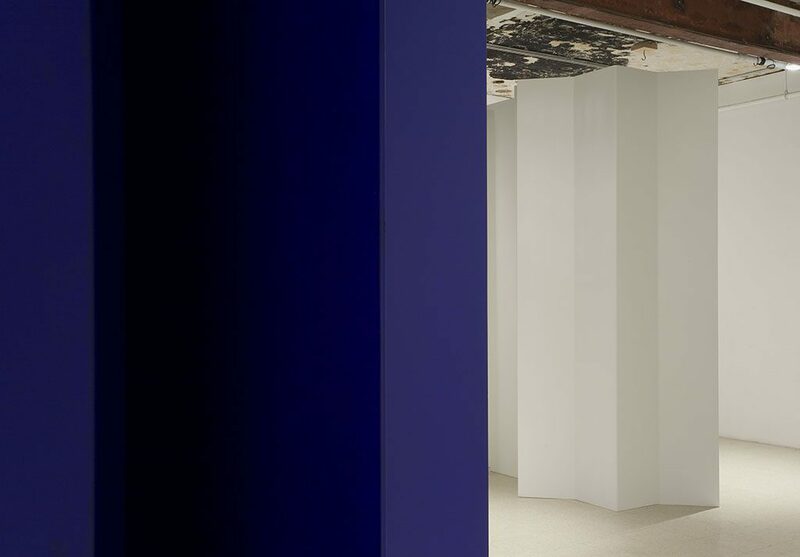 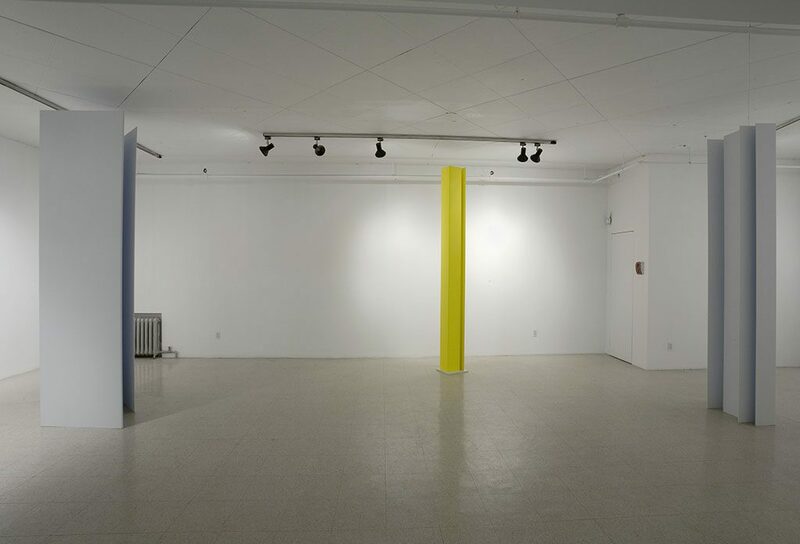 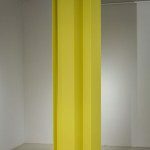 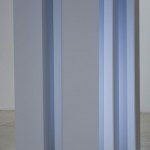 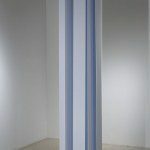 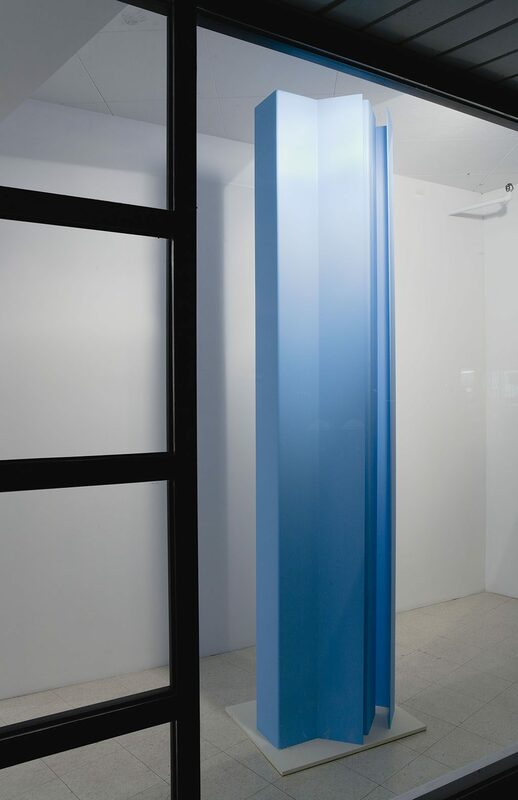 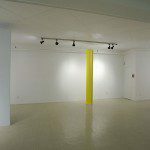 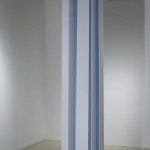 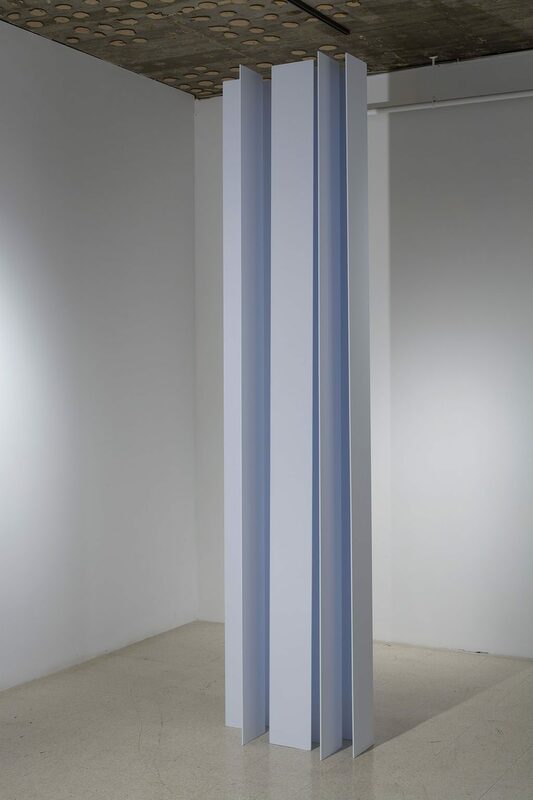 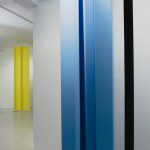 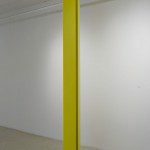 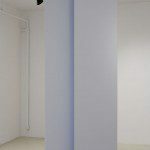 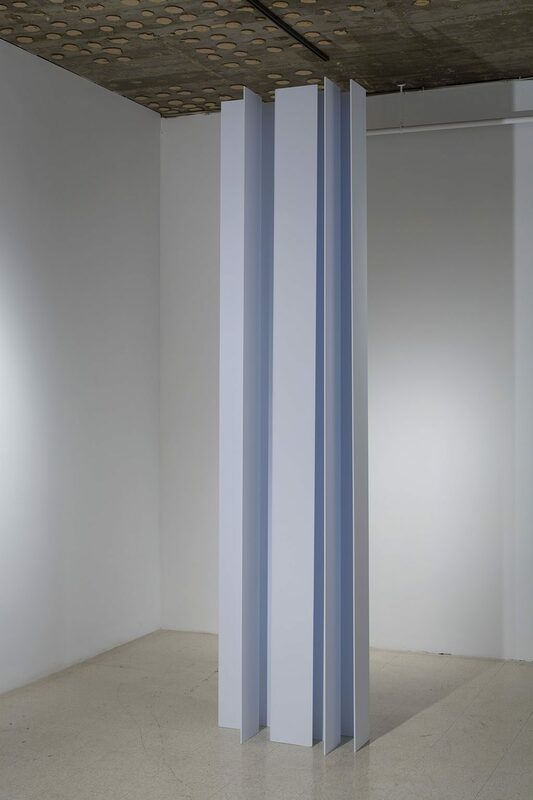 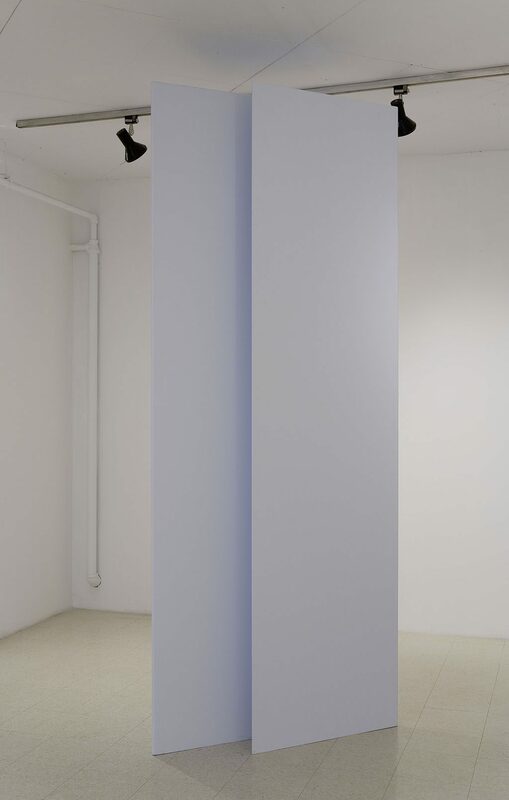 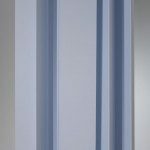 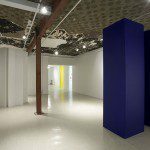 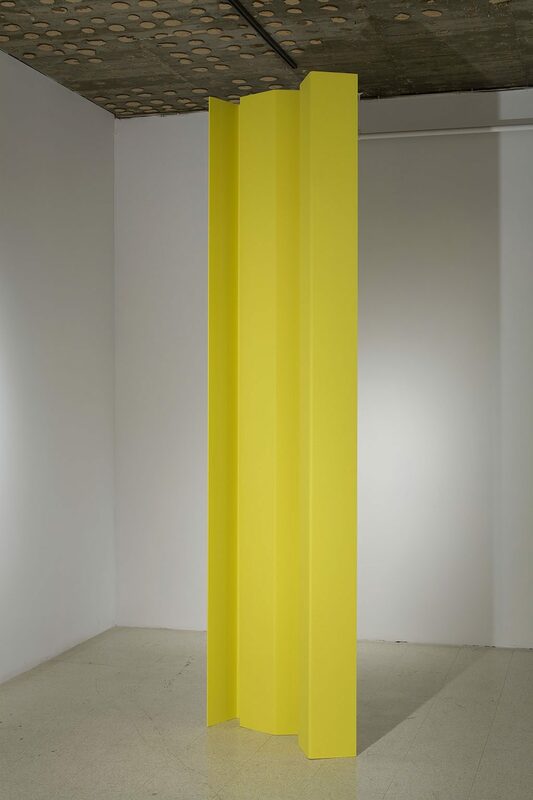 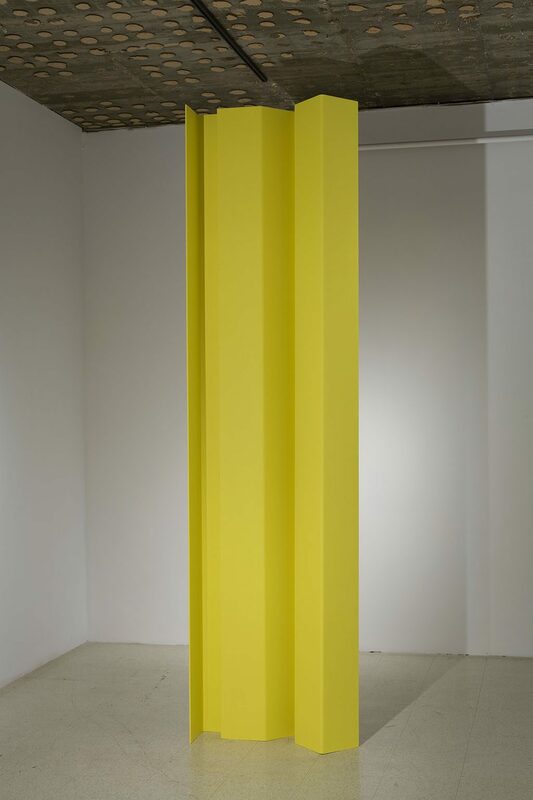 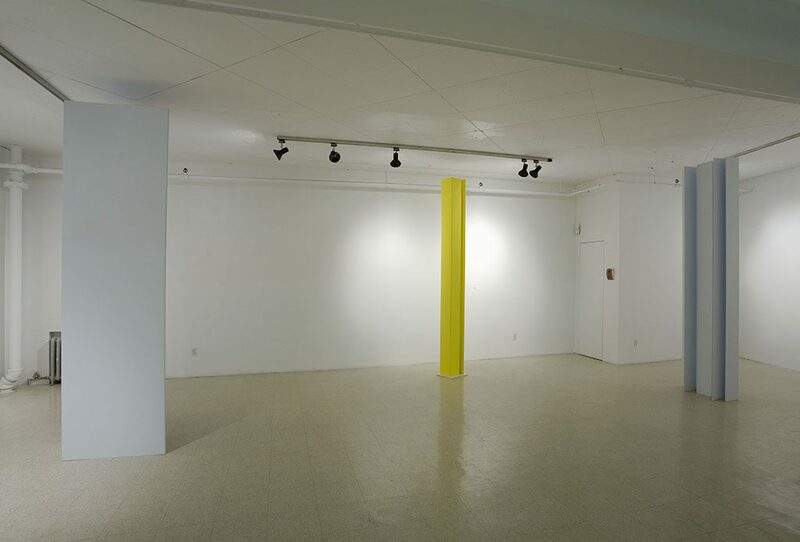 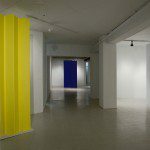 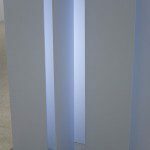 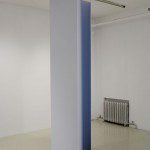 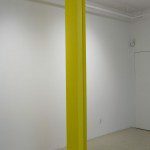 (Danielle Corbeille,Claude Tousignant) The interaction between colour and form lends itself to a study of movement, where shadow and light play with the vertical angles as an intervention within the gallery space. 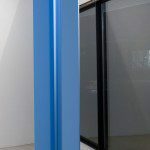 Pushing the notion of the painting as autonomous object, these sculptural forms also translate as paintings against a renegotiated space: the fluctuating notion of contemporary white cube. 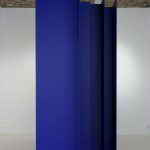 Nonetheless with the base components of these works referencing buildings and building materials, these forms are also a distillation of structure. 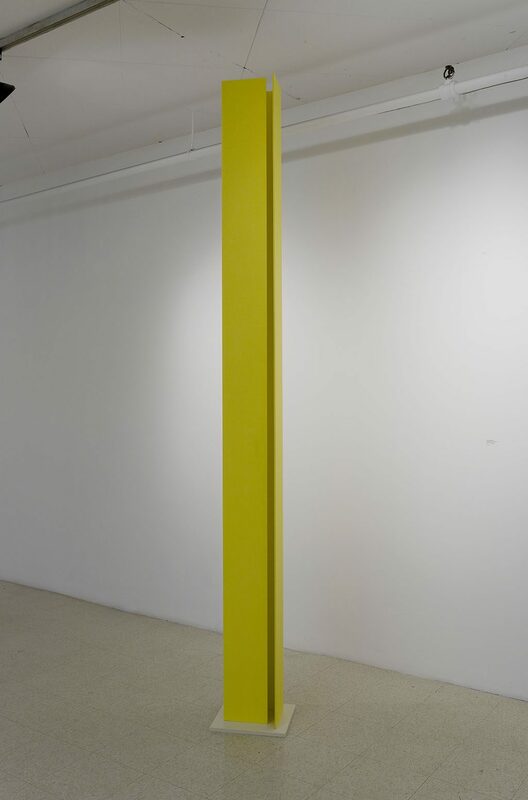 Here, the recurring tension between painted and sculptural form is evidence of Tousignant’s capacity to probe definitions that have not yet been resolved.